Uncommon to common, yearlong resident of open oak, pinyon-juniper, riparian, redwood, and mixed conifer habitats. Tolerant of humans; found in small towns, suburbs, farms, ranches, and meadows. Occurs the length of the state to above 2450 m (8000 ft), except in central and western portions of the Mojave Desert (Garrett and Dunn 1981). Feeding: Perches and pounces, and stoops for mice and other small mammals, birds, fish, reptiles, amphibians, and arthropods in meadows and other openings in trees. Preys on small birds frequently in nesting season (Van Camp and Henny 1975). Insects important in summer and fall (Ross 1969). Cover: Roosts in woodpecker hole or other cavity in snag or tree, under moderate canopy. Reproduction: Obligate secondary cavity-nester. Uses abandoned woodpecker hole, or other cavity in snag, hollow tree, log, stump; occasionally uses nest box. Nest usually 4.6 to 18 m (15-60 ft) above ground. Water: Most water requirements apparently obtained from food (Bartholomew and Cade 1963). In captivity, can exist without water, but will drink if water available. Mosher (1976) described respiratory water losses. Pattern: Uses edges of oak, riparian, or conifer habitats with snags, tree cavities, or woodpecker holes for nesting and roosting, and openings and meadows nearby for feeding. Activity Patterns: Yearlong, nocturnal activity. Seasonal Movements/Migration: Not migratory, but some altitudinal movement apparently occurs in response to inclement weather. Home Range: Craighead and Craighead (1956) reported 1 to 1.3 per km² (0.4 to 0.5 per mi²) in winter, 1.8 to 5 per km² (0.7 to 1.9 per mi²) in summer, and 1 nesting pair per km² (0.4 per mi²). In Wyoming, they reported 0.7 nesting pairs per km² (0.3 per mi²). Territory: Mean territory size in woodlands in Kansas was 0.3 ha (0.7 ac), according to a few samples (Fitch 1947). Pairs often remained on the same territory for several years. Reproduction: Breeds early February through June. Eggs mostly laid in April. Clutch size 1-8, usually 3-4; apparently decreases to the north along the Pacific Coast (Murray 1976). Incubation 21-30 days, and nestlings fledge at 28-35 days (Van Camp and Henny 1975). A nesting success of 3.8 young per nest, and 69% of all nesting attempts successful, reported by Van Camp and Henny (1975). Adults remain paired throughout the year(Call 1978), and pair often found together in nest cavity in daytime (Ehrlich et al. 1988). Niche: Predators include accipiters, great horned owls, and spotted owls. Squirrels, weasels, other tree-climbing mammals, and gopher snakes take young (Whitfield 1934, Marshall 1967). Interspecific competition for nesting sites between screech-owl and other secondary cavity-nesters apparently strong, and may limit numbers in some areas. Bartholomew, G. A., and T. J. Cade. 1963. The water economy of land birds. Auk 80:504-539. Call, M. W. 1978. Nesting habits and survey techniques for common western raptors. U.S. Dep. Inter., Bur. Land Manage., Portland, OR. Tech. Note No. 316. 115pp. Ehrlich, P. R., D. S. Dobkin, and D. Wheye. 1988. The birder's handbook. Simon and Schuster,New York. 785pp. Fitch, H. S. 1947. Predation by owls in the sierran foothills of California. Condor 49:137-151. Garrett, K., and J. Dunn. 1981. Birds of southern California. Los Angeles Audubon Soc. 408pp. Marshall, J. T., Jr. 1957. Birds of pine-oak woodland in southern Arizona and adjacent Mexico. Pac. Coast Avifauna No. 32. 125pp. Marshall, J. T., Jr. 1967. 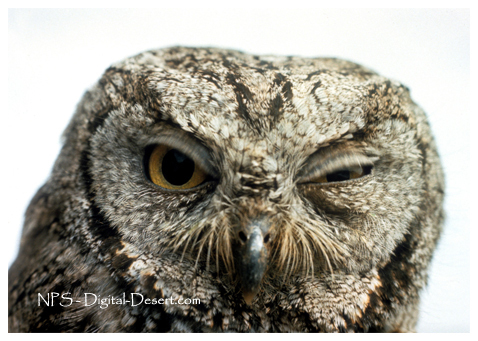 Parallel variation in northern and middle American screech owls. West. Found. Vert. Zool. Monogr. No. 1. 72pp. Mosher, J. A. 1976. Raptor energetics: A review. Raptor Res. 10:97-107. Robertson, J. M. 1931. Birds and eucalyptus trees. Condor 33:137-139. Ross, A. 1969. Ecological aspects of the food habits of insectivorous screech owls. Western Found. Vert. Zool. Proc. 1:301-344. Van Camp, L. F., and C. J. Henny. 1975. The screech owl: Its life history and population ecology in northern Ohio. N. Amer. Fauna No. 71. 65pp. Whitfield, C. J. 1934. A screech owl captured by a snake. Condor 36:84.